Thomas White Eagle’s school of shamanic and wizardly arts. The process always starts with personal cleansing and gaining respect for life and the Creation which is best obtained by participating in 3 tobacco cleansing rituals. Once you have gone thru those you can ask for a personal consultation where your personal healing and learning path will be designed. The studies take many years. We issue certificates of completion after each 10 years of studies with us. This northern Amazonian tradition reaches back more than 3000 years. A tea made from specially cured tobacco known as Tabaco Mapacho is consumed to induce vomiting. This is traditionally used to foster strength and mental clarity. 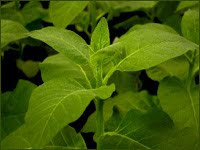 Tabaco Mapacho is considered a masculine, solar, master plant, held as sacred in Peruvian Amazon basin. A warm tea is made from the tobacco and consumed, followed by warm water. The vomiting which follows stimulates the elimination of toxins and blockages (physical, mental and emotional). 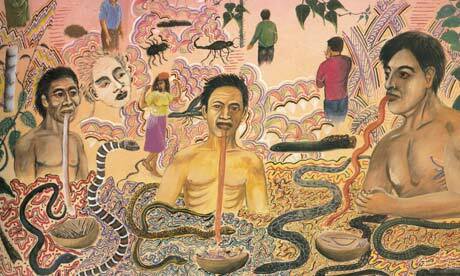 Vomiting in traditional Amazonian cultures is considered a healing action, a way for the body to purge illness and negative energies. Thus, vomiting is a natural act in keeping with being a balanced human being, and we can induce it for healing, just as many wild animals occasionally consume certain wild plants in order to purge. During the tobacco session, the act of vomiting itself is not the unpleasant experience you may associate with heavy alcohol drinking or food poisoning. Instead, it can feel warm, cathartic and liberating. To enjoy the full benefits of this medicine, it is compulsory to come to this ritual with an empty stomach. This session is not recommended for pregnant women and those who suffer hypotension (abnormally low blood pressure), or those who have had traumatic injury or operations involving the brain or heart. No Spicy Food – avoid onions, garlic and chile. Mild spices such as leaf thyme, basil and oregano are OK.
do not eat/drink anything for 3-4 hours before the session. After a ceremony or retreat where the teacher plants (Tobacco, Ayahuasca, San Pedro, Peyote, etc.) are used it is essential for you to set aside time to reflect on the experience. If possible, allow yourself at least 3 days to reintegrate what you have experienced into your day-to-day life. You are likely to be very sensitive and open after your journey, so be gentle with yourself. Do your best to avoid stress and create a healing, quiet space where you can get plenty of rest, good sleep, healthy food and time in nature.